Sweet of the Month & Giveaway! Yes you read it correctly, month. As you may or may not know, Sweetopia has been undergoing some changes with Sweet of the Week. To add to the chaos, it will from here on in be retitled: Sweet of the Month. To find out what Sweet of the Month is all about, a list of FAQ's and more, click here. Since there's likely going to be a bit more competition and voting: 24 contestants will be hand picked by Marian. To sweeten the deal, we're adding something special to this month's competition. Our wonderful sponsor Beyond Pots and Pans is excited to provide this competition with a product giveaway! 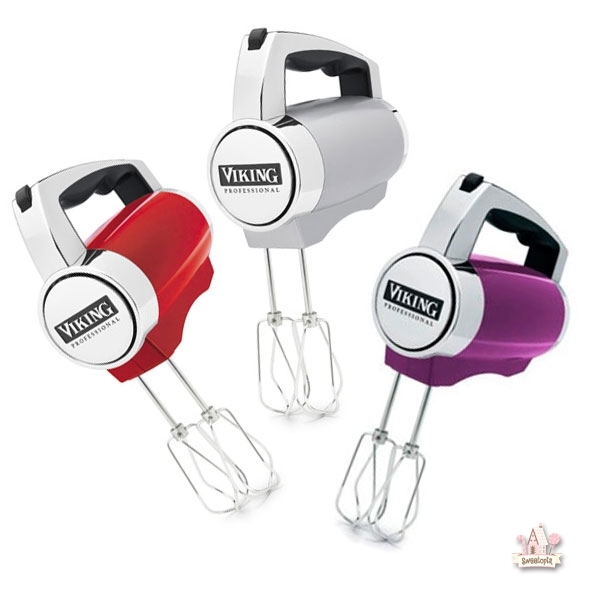 Once all the votes for the 24 contestants are in, one Viking Hand Mixer, in the color of their choice, will go out to the winner. Ok so, we realize not everyone can win, and not everyone will be chosen to compete. And what about the people who just vote? They deserve a little something too! All Sweetopia readers can now enter the offer code SWEET at Beyond Pots and Pans for a 10% DISCOUNT on anything in store. Everyone gets one week to submit something special for voting. (Submission dates; January 15th – 21st, 2012). The contest is international. Voting by you will begin Jan. 22nd and extend until February 18th, 2012, 9pm EST. The winner will be announced on Facebook, twitter, pinterest and contacted for shipping information. Hi @ Adriana Pereira and @ Jennifer McEldowney: Please read/click on the ‘Older Comments’ for your answer. All the best and thanks for entering! Even if I miss being able to enter, i am so excited to see all the yummies..
@ Sandra: The FAQ’s and other info. (there’s a link in the post above), should help. so at wat time wil the voting start!! @ Vanessa: Will let you know on facebook and twitter if there are issues, otherwise they begin around 1am EST. Hi Marian, I posted my photo at the beginning of the week and everything seemed fine, but it doesn’t show up in the photos to be voted on? Was it only some of the photos that were included in the voting process?